Sometimes when the clutter in my head gets to be too much, whether it’s a conscious trigger or not, I am moved to clean out my closet, and mostly the storage bins of clothes I keep in the attic, due to a lack of space in my bedroom. Dutch houses are SMALL, and they normally don’t come with built-in or wall-to-wall closets of any respectable size (a walk-in closet is every Dutch woman’s dream), if they come with these at all. Most people have small wardrobes in their bedrooms, and are accustomed to switching out clothes according to the season. Fall and winter clothes are moved upstairs, to the attic (or all the way downstairs, if you have a cellar and it isn’t too moldy and damp to store clothes), during the spring and summer, and the summer and spring clothes are stored away during the winter. This was the case again yesterday. Or rather, the night before that, when I got the urge to purge and realized this weekend was my window of opportunity since my youngest son, who sleeps in the attic (not as punishment, it just happens to be the largest room upstairs, half of which is occupied by storage bins, most of which hold my clothes or the old toys of his he can’t bear to part with), would be away this weekend, on a camping trip with his father. This is a task I can only complete when I have the run of the room, since it’s usually a no-go area when he’s home. Armed with three large, empty garbage bags and the vacuum cleaner (no point in moving all that stuff around if I’m not going to vacuum while I’m at it), I made my ascent to the attic. Two hours and several sneezing fits later, I was staring at three full bags with a tremendous sense of satisfaction. And I wasn’t even done yet – there was still the closet and chests of drawers in my bedroom to tackle. After a break of three or four hours, I resumed my task and dealt with those too, filling bag no. 4, and my sense of accomplishment, even one day later, is like a high. My head is clearer, my thoughts can run freer. Each pile is reminiscent of a phase from the last 10 (15?) years, and each phase is chock full of memories. Oh good grief, there are those corduroy dress trousers I bought for that conference in London (medium-level Fat Stage) that I haven’t worn since. Oh geez, and that super skimpy bikini I bought because I had lost weight and gotten in shape, but which was really pushing the limits of decency, even at the time. Consider yourself chucked, in the bag you go (unworn, in public, at any rate). There are the miskoops (one of those Dutch words that I love and find semi-untranslatable: ‘bad idea’, ‘waste of money’ will suffice for now), that fashion-conscious friend talked me into buying (her motives were unclear, but I would venture a guess that they weren’t pure), saying they looked fantastic on me, but which I secretly never really liked and thus never wore. Or the items I bought on those ‘what-was-I-thinking’ days, the ones you take home yet never wear because they just look stupid, or are unflattering. Then there are the items I completely forgot I had, and by the time I remembered, it was too late (they no longer fit or turned out to be a bad idea anyways). Then there are the ones that make me saddest: clothes I loved to wear because I was at my thinnest, and remember how good I felt wearing them. To save, or not to save? Will they ever fit again? And even if they do fit, how out of style will they be should that day ever arrive? Do I save one or two as ‘motivation’, or for sentimental reasons? I can picture holding them up, to no one in particular and saying ‘Can you believe this ever fit me?’ Nope. In the bag you go. What do I do with all the T-shirts from concerts and festivals? Do I also earmark these for the Sentimental Value pile, never to be worn again, only to be looked at now and then as I think, ‘Ah, good times’? For my kids to find when I’ve left this life, so they can know how hip I once was? Nah. Be gone, all of you. I’ve watched those programs time and time again, the ones with those super-practical women, living in minimalist houses, always full of tips for cleaning out closets, dumping the extraneous crap in your home, and though the one ‘rule’ has stuck with me (‘If you haven’t worn it in the last two years, odds are you probably never will.’), I don’t always abide by it, though it is a good truism. Rarely do I have regrets about getting rid of clothes during these purging episodes. I do recall one particular regret though: getting rid of a long, khaki-colored leather skirt that I bought when I was studying in France in college. Although I catch myself briefly wishing I still had it, mostly for the memories, what’s the point? Hitting a milestone age this year, I found I didn’t have the overwhelming sense of nostalgia for my younger years I used to feel during one of these clothes dumping sessions. I look back on those years with fondness, the years before I had my kids, the years when they were babies (and yes, I got rid of the maternity clothes AGES ago – I’m not that bad off), and I struggled to create a personal style that matched my new state of motherhood – not too hip or trendy, I was a mom now! Not too frumpy; I was still relatively young! – and later, when the baby weight was nearly gone (many, many years later), and I felt more comfortable with who I was, a style appropriate to a woman in her mid- to late 30s and early 40s, the mother of young, pre-pubescent children. Today, a day later and a few stuffed garbage bags richer, I feel a weight lifted, if only in the symbolic sense. 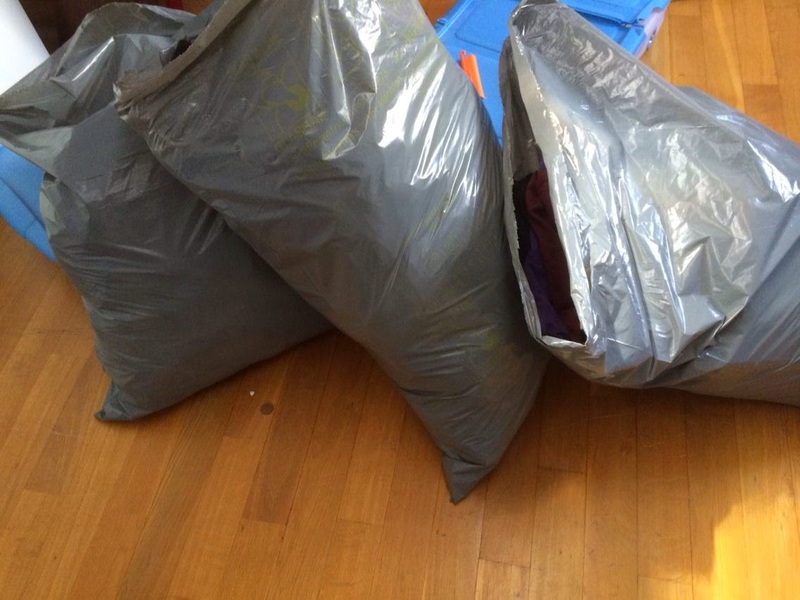 I know the clothes will go to a worthy recipient, someone who needs and will enjoy them, and who will then be able to pass them on (assuming they haven’t disintegrated by then), either to a textile recycling facility or someone else who needs them. My memories will still be in my head (until they too disintegrate), even if the clothes are no longer in the attic or my closet. They’re just clothes, it’s just stuff; the memories will last long after the clothes have fallen apart or been passed on.